The marvelous and fascinating march of vehicular technology is satirized in this extremely rare, separately-issued lithograph printed on linen that highlights the early nineteenth-century British passion for improved transportation. It depicts a wild fantasy overrun with improbable vehicles from the impracticable and obsolete to the quixotic: steam-powered carriages, giant hydrogen balloons, and men with wings. In handkerchief format printed in red, it was also offered in sepia (McCormick Collection of Aeronautica, Item 284, no. 60, Princeton University). The McCormick impression is the only other copy known to survive. 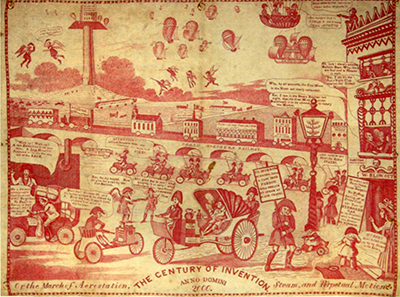 Though balloon travel was no longer considered viable when this handkerchief lithograph appeared, Londoners nonetheless waft over to Dublin and back before breakfast. A balloon race is also taking place (between the “Out o’Sight Club” and the “United Moonites”). The flying men hunting a flock of birds are oblivious to the fact that they will likely shoot down the balloons. The image is an enlarged, reversed copy of a lithograph by caricaturist Charles Jameson Grant from the Every Body’s Album & Caricature Magazine no. 3, February 1, 1834. “Everybody’s Album contains some of Grant's finest lithographic work, as well as displaying his imagination at its most fertile". (R.J. Pound, ed., C.J. Grant's Political Drama: A Radical Satirist Rediscovered, 1998, p. 10). Ironically, the fleet of various ground vehicles predicted for the year 2000 runs on coal, the original fossil fuel. According to this lithograph, by the second millennium, "Why, by all accounts, the coal mines of the North are nearly exhausted," one lady at a window exclaims. "Yes," her companion says, "I saw in the Steam Register last night that the coal mine under Blackheath is to be opened to supply the market." Considering that London - which, until recently, excepting vehicles, ran on coal - endured The Great Smog of 1952 when 12,000 people died from a toxic cloud of coal smoke pollutants that hung over the city for five days, one can only conclude that if cars were also fueled by coal the year 2000 would be the year of the Great London Black Sky, when a foggy day in London town would seem like a sunny day in Southern California by comparison, and Fred Astaire, unable to see his shoes through the thick haze, would fall and break his leg. [GRANT, Charles Jameson, after]. The Century of Invention. Anno Domini 2000. Or the March of Aerostation, Steam and Perpetual Motion. [London? c. 1834]. Lithograph printed in red on linen as handkerchief. Image 15 x 19 1/2 in., (380 x 495 mm. ); sheet 15 1/8 x 21 1/2 (384 x 548 mm). Image courtesy of Martayan Lan Rare Books, with our thanks. Don't Wipe Your Nose With This Map.